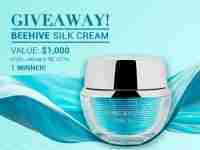 Enter for a chance to win a Beehive Silk Cream. Transform dry dull skin into a satin-smooth complexion with the Beehive Silk Cream. This silky lightweight solution is formulated with bee venom green tea and hyaluronic acid to protect your skins natural moisture levels while delivering skin-benefiting antioxidants. With regular use you can expect softer more luminous skin.